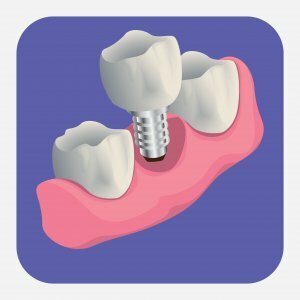 Dental Implants: What Happens Without Treatment? Your smile is one of the first things that people notice when they meet you. A beautiful smile is a sign of health and youth. Missing teeth, however, can have a negative effect, impacting your appearance and harming your confidence. Common treatments to replace missing teeth include partials, dental bridges or full dentures. When you do seek appliances to replace your missing teeth, the characteristics of the chosen treatment method will influence its longevity. Patients should discuss their options, including the advantages and disadvantages of each treatment, thoroughly before coming to a final decision. If you choose not to replace the missing teeth at all, your oral health will suffer, as will your smile’s esthetics. Not only is a gap in the smile quite noticeable and distracting, it also provides an opportunity for the other teeth to shift out of their proper positions to fill in that space. If that happens, the teeth may no longer fit together properly and your chewing ability can become less efficient. Another concern related to tooth loss is jawbone resorption. The tooth’s root plays an important role in the smile’s well-being even though it is obscured by gum and bone tissue. The root helps to hold the jaw in place. When it is missing, the jawbone wears away. Even opting for a bridge or dentures can lead to negative outcomes years down the road. Because those appliances do not have structures that replicate the absent root, the jawbone will continue to erode and the appliances will ultimately fail. Dental implants are often the ideal tooth replacement option, because they replace the missing tooth’s root as well as the crown. Dental implants do not require support from adjacent teeth, and they keep the jawbone strong. With dental implants, patients do not experience increased tooth decay or sensitivity. If you would like more information about replacing missing teeth with dental implants, contact Dr. Mohammed Erakat for a consultation today at 732-297-7000.